Painter, sculptor, writer and philosopher Lee Ufan came to prominence in the late 1960s as one of the major theoretical and practical proponents of the avant-garde Mono-ha (Object School) group. The Mono-ha school of thought was Japan’s first contemporary art movement to gain international recognition. It rejected Western notions of representation, focusing on the relationships of materials and perceptions rather than on expression or intervention.The artists of Mono-ha present works made of raw physical materials that have barely been manipulated. 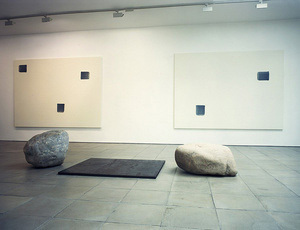 In 1991 Lee Ufan began his series of Correspondance paintings, which consist of just one or two grey-blue brushstrokes, made of a mixture of oil and crushed stone pigment, applied onto a large white surface. His sculptural series Relatum is equally minimal: each work is comprised of one or more light-colored round stones and dark, rectangular iron plates. The dialectical relationship between brushstroke and canvas is mimicked in the relationship between stone and iron plate. In Ufan’s installations space is at the same time untouched and engaged, at the confines between doing and non-doing. The relationship between painted / unpainted and occupied / empty space lies at the heart of Lee Ufan’s practice. 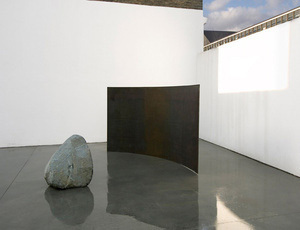 Lee Ufan was born on June 24th, 1936, in Kyongnam, South Korea. He studied calligraphy, poetry and painting at the College of Kyongnam and the University of Seoul. His work has been shown at the Pompidou Metz, Metz, France (2019); Serpentine Galleries, London, UK (2018); Couvent de la Tourette, Eveux, France (2017); Centre de Création Contemporaine Olivier Debré, Tours, France (2017); Château La Coste, Le Puy-Sainte-Réparade, France (2016); Palace of Versailles, Versailles, France (2014); Guggenheim Museum, New York, NY, USA (2011), Royal Museums of Fine Arts of Belgium, Brussels, Belgium (2009); the Yokohama Museum of Art, Yokohama, Japan (2005); the Musée d’Art Moderne de Saint-Etienne Métropole, Rhône-Alpes, France (2005); the Samsung Museum of Modern Art, Seoul, South Korea (2003); Kunstmuseum Bonn, Germany (2001); the Galerie Nationale du Jeu de Paume, Paris, France (1997); and the National Museum of Contemporary Art, Seoul, South Korea (1994). He was awarded the Praemium Imperiale for painting in 2001 and the UNESCO Prize in 2000. In 2010 the Lee Ufan Museum, designed by Tadao Ando, opened at Benesse Art Site, Naoshima, Japan. In 2019, Lee will be the subject of a major solo show at Center Pompidou-Metz, Metz, France. Two iron plates and two natural stones Iron plates: 140 x 115 x 3cm / 55 x 45 x 1 in. Stones: 40 x 40 x 40cm / 16 x 16 x 16 in. Glue on canvas 163 x 130 cm / 64 1/4 x 51 1/4 in. Iron and Stone 270 x 240 x 170 cm / 106 1/3 x 94 1/2 x 66 2/3 in. Iron plate and stone plates 220 x 200 x 1 cm / 86 1/2 x 79 x 1/2 in. Oil on canvas 227 x 182 cm / 90 x 71 1/2 in. Stone paint on canvas 182 x 228 cm / 71 1/2 x 90 in. Oil on canvas 146 x 195 cm / 57 1/2 x 77 in. 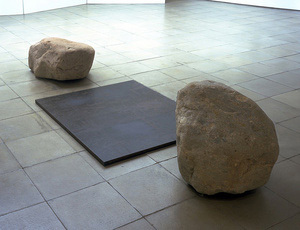 Four iron plates and four stones Stones: 50 x 60 cm each / 19 1/2 x 23 1/2 in. each Iron: 140 x 130 cm each / 55 x 51 in. each When installed: 305 x 305 x 61cm / 120 x 120 x 24 in. Oil on canvas 227 x 182 cm / 89 x 71 1/2 in. Iron plate and stone 50 x 220 x 200 cm / 20 x 86 1/2 x 79 in. Four curved steel bars and stone 367cm x 308cm / 144 1/2 x 121 1/4 in. Oil on canvas 218 x 241 cm / 85 7/8 x 94 7/8 in. Oil on canvas 218 x 291 x 6cm / 86 x 114 1/2 x 2 1/2 in. Oil on canvas 93 x 73 x 4 cm / 36 1/2 x 29 x 1 1/2 in. Gravel, glass, steel, stone Glass 250 x 250 x 2 cm / 98 1/2 x 98 1/2 x 1 in. Steel 250 x 250 x 2 cm / 98 1/2 x 98 1/2 x 1 in. Stone 70 x 70 x 70 cm / 27 1/2 x 27 1/2 x 27 1/2 in.